The Fisher IsotempGravity Convection Incubator provides you with uniform, efficient heating for basic incubation needs. This 2.2 cu ft incubator has a temperature range of 30° to 75°C (86° to 167°F) programmable from the bright, easy to read, digital control panel in increments of 1°. This sturdily constructed incubator has a corrosion resistant stainless interior and heavy-duty steel and aluminum exterior that sandwiches 3 in thick insulation. The tempered glass door of this lab incubator helps maintain the environment while monitoring progress, and temperature recovery after a door opening is usually within two minutes. 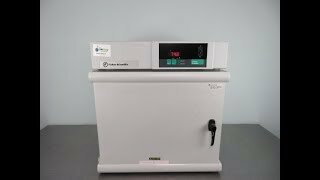 This Isotemp incubator also features a visual over temperature alarm if the actual temperature exceeds 3 degrees past setpoint. 30° to 75°C (86° to 167°F). This Fisher Scientific Isotemp Incubator 11-690-625D has been fully inspected and reached temperature without issue. All of our lab equipment comes backed with our standard warranty. Should you have any questions, please don't hesitate to contact us.